President Donald Trump opened his first Christmas Eve in office by offering season’s greetings to U.S. troops stationed around the world and applauding the sacrifices their families make when their loved ones are away. 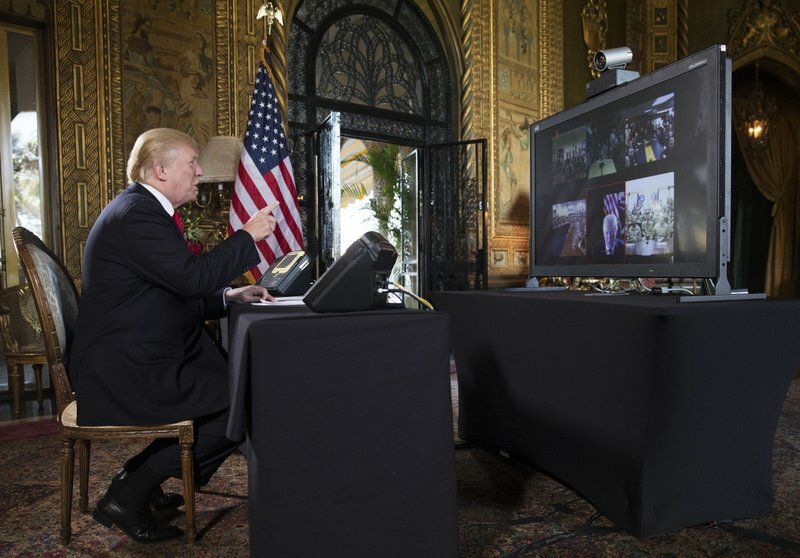 Trump spoke briefly by video hook-up on Sunday to members of the Army, Navy, Air Force, Marine Corps and Coast Guard stationed in Qatar, Kuwait and Guantanamo Bay, Cuba, and patrolling the Strait of Hormuz in the Middle East. Vice President Mike Pence rallied U.S. troops stationed in Afghanistan during a surprise visit last week. Trump complimented each branch of the armed forces. He said the Army’s “Iron Brigade” combat team in Kuwait is performing a “vital mission” by partnering with the Iraqi, Kuwaiti, Saudi Arabian and Jordanian armies, and providing force protection in Syria and Iraq. He said a Kuwait-based, Marine air-ground task force has provided more than 4,000 flight hours of close air support in the campaign against the Islamic State group, and he thanked sailors aboard the USS Sampson for defending “high-value assets” in the Strait of Hormuz. But he seemed to reserve the most praise for the Coast Guard, which impressed the president with its rescue operations during a devastating hurricane season in Florida, Texas, Puerto Rico and the U.S. Virgin Islands. Puerto Ricans, however, may question the president’s upbeat assessment of their state of mind. Power generation on the U.S. territory is at 65 percent of normal, with nine of Puerto Rico’s 78 municipalities still completely in the dark more than three months after Hurricane Maria walloped the island. The U.S. Army Corps of Engineers has estimated power will not be fully restored across Puerto Rico until May. More than 200,000 homes were damaged and more than 30,000 people have lost their jobs, sparking an exodus of more than 200,000 Puerto Ricans to Florida alone. “Every American heart is thankful to you and we’re asking God to watch over you and to watch over your families,” he said, before he asked journalists to leave the room so he could begin taking questions from the service members. Trump planned to join first lady Melania Trump later Sunday to answer telephone calls from kids seeking updates on Santa Claus’ whereabouts from the NORAD Tracks Santa program. The North American Aerospace Defense Command has tracked Santa’s flight for more than 60 years.